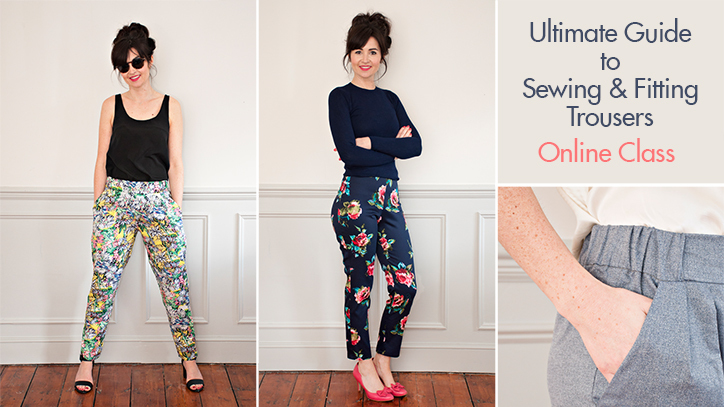 the Ultimate Guide to Sewing & Fitting Trousers! As the name suggests, this course is all about learning how to sew trousers and achieve the perfect fit. Start by nailing trouser construction as you make a pair of loose-fitting, perfect-for-summer Carrie Trousers. Then we’ll move on to the Ultimate Trousers, where we will really work on conquering the ever-terrifying fit! 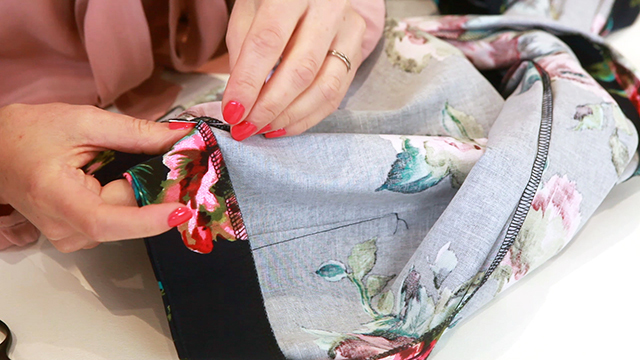 There is so much to learn on this online sewing class! The Carrie Trousers are brand new and were specially designed for this online class. Easy to fit, they are a great starting point for newbie trouser sewers who want to get to grips with construction. The Ultimate Trousers are one of our bestselling sewing patterns, but we know that mastering the fit of these slim-fitting trousers is something many of you are scared of having a go on your own. This part of the course concentrates on just that, helping to diagnose fitting issues, before showing you how to alter your pattern to make it work for your body. Let us introduce the patterns properly! Inspired by the effortless summer wardrobe of Carrie Bradshaw, the Carrie Trousers are perfect with flats or a day on the beach or a Sunday stroll through the park, but work just as well dressed up for an evening with heels for a glam look. The Carrie Trousers are loose-fitting through the leg, slightly tapering towards the ankle. With no need for any tricky closures, they have a flattering flat-fronted, elasticated-back waistband with pretty pleats at the front. Practical and ideal for summer, the Carrie Trousers are mid-rise and feature ever useful slanted pockets at the side seams. The Ultimate Trousers are a slim-fitting, ankle grazing trouser, flattering for so many figures. They are a year-round staple in Lisa’s wardrobe. Dress them up or down, they’re perfect for so many occasions. Simple in design, with the Ultimate Trousers you can go to town with your fabric choices. Make a pair in a structured black cotton drill and look as classic as Audrey Hepburn, or for a fun summer look, choose a funky patterned stretch cotton. There are so many options with the Ultimate Trousers! Why are online courses great? Dip in and out of the course as you like, and learn at your own pace. Rewind as many times as you’d like! Fit your sewing around your busy schedule. With access to the course 24/7, stop and start at your leisure. Wherever you are in the world, get the Sew Over It class experience from the comfort of your own sewing table. The course never expires! Buy now and start sewing whenever suits you. If you want to start the course in six months, you can! Your access to the course is indefinite! Sew as the mood takes you. Drink wine at the same time if you like! Think an online class might be for you? Watch our video to see the course in action! We are so excited about this online class. If you want to expand your sewing skill set and make the perfect fitting pair of trousers, we’d love to see you on the course. Sign up by midnight on Monday 6th June 2016 and save £10! Use code YAYTROUSERS at checkout!